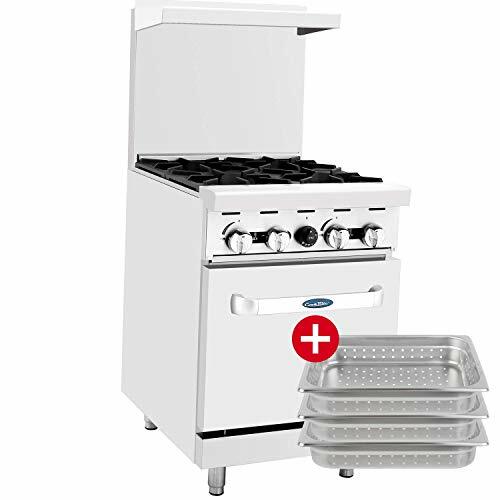 Add an invaluable piece of cooking equipment to your busy commercial kitchen with this gas range! A great way to produce consistently high-quality food while getting the most out of your operation's valuable floor space, this versatile machine is equipped to handle a variety of tasks, provide you with top-of-the-line cooking performance every time! Since this unit features 4 open top burners with 1 standard ovens as the base, you can fry and simmer on top while eliminating wasted space by using the ovens below for your baking and warming needs. And even features a grease trough for easy cleanup. This unit suits the cooking requirements of different foods. This range's cast iron grates allow you to easily slide pots from one section to another, while protected individual burner pilots eliminate spillover outages. And, extra deep crumb tray further expedite the cleaning process, as they can be removed and emptied easily. A fully welded frame combines with stainless steel front, sides, backriser, and lift-off high shelf to ensure long-lasting use in your commercial kitchen. Stainless steel adjustable legs come standard. Power Type: Natural Gas.Ship from USA. Heavy duty burners,with a stable flame,standby pilots.Heavy duty cast iron grates for a strong bearing performance. Stainless steel front, back, sides, kick plate including back guard and high shelf. Self-reset high temperature limiting device.Heavy duty lift off cast iron burners rated at 25,000 BTU/hr. Oven burner rated at 24,000 BTU/hr.Total 124,000 BTU/h. Oven pilot with 100% safety shut off. Multiple position oven rack guides. ATOSA US, contact us by completing and submitting the form below. If you are looking for a specif part number, please include it with your message.